Me: I'm planning on running five or six miles, depending on how the little midge is doing. Me: Less? Oh, right, if my knee hurts. Hubby: Remember, don't be a hero. Be a wuss. With that parting conversation ringing in my ears, I headed out for a run with my littlest midge in the jogger on Saturday. I was an obedient spouse and kept it slow, added a loop at the end rather than a complete out and back to avoid any downhills (doctor's orders), and walked back through the door at 5.25 miles. It was a great run with perfect weather around 45 degrees. My little one fell asleep one mile in and started to wake up less than a mile from home. My legs were a little sluggish at first but felt better and better as the miles passed. One of these days I'll plug the G-man into the computer so I can share more specifics, but for now I am okay with not knowing. I'm just enjoying the run. I smelled a skunk around the two mile mark; then on my way back there was a dead skunk where there was not a skunk before. It was gross but also a little sad. My husband asked if I kicked it to the side of the road so it wouldn't keep getting run over. Ummm, no. I thought about taking a picture but decided if you really want to see pictures of fresh roadkill you can Google it. 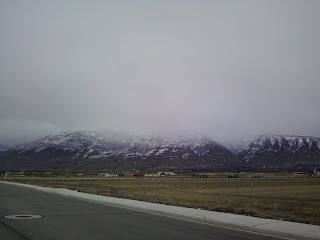 It was cool to actually be able to see the snow moving down the mountain. I haven't solidified my running plan for the next 13 weeks, but I am running tonight. The finer details of that run are TBD. I had a highly stressful morning putting out fires (not literally because that would be crazy) for a work project I am trying to finish. I crave (literally this time) running when I am stressed. Do you?? I gots to get my run in - especially when I am stressed. Absolutely crave running when I am stressed. Thank God I have it to help. Love the pic of the little one in her stroller. And what a gorgeous bit of scenery. Mountains are awesome! Well done on your 5+ miles! Whoohooo! It is interesting being on the path to marathon, as I feel like it isn't so much a matter of running just for the fun of it...don't get me wrong - it IS fun...but moreso I am running whether I feel like it or not. I made the commitment, so I have no choice. (But not in a bad way.) Does this feeling go away after the big race? Or will I just crave another one to train for...? I smelled skunk the other night and thought it has got to be too cold for the little critters to be out! good work on the run! I am craving one too if this snow will stay at bay! Great picture! 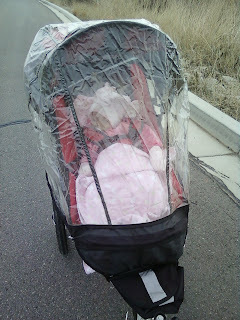 I totally envy that you have a little one that will fall asleep in the stroller. Mine hasn't done that since he left the baby bucket. Great job on the mileage! Glad that you are on your way to recovery. Your husband sounds like my boyfriend. Hes always making sure I don't over do it and that I stop if I have pain! Glad you were able to get a run in! Good for you for getting out there, you wuss :) Those mountains are gorgeous. When my husband asks me if I need to go on a run, I know that I'm getting a bit ornery. I crave the run too. I'm glad you're healing up nicely. Good luck on figuring out the rest of your training program. That's always tricky when you're just coming off an injury. what a great photo...and great that your little one cooperated for it! Crave. Oh yeah. That is an understatement. I NEED to run. I know I shouldn't but running is my fix all for life. If I am stressed running melts it away. If I need time to think running provides it. If I am feeling unfit, fat, lazy, bored, unproductive....running fixes that. Yeah when I don't run I crave it! Running with the little one to keep you company. Nice! I never understood how people can run and push a jogger, but that's just me, because I sometimes have difficulty walking and talking at the same time. I love the comments from your husband. I get similar comments from my wife. Aren't supportive spouses the best?! Thanks for the positive thoughts to help my "delicate" injury. You made me smile. I am now officially a Follower of your blog. You've been warned...LOL.